Think the 'D' in BYOD applies only to 'Device'? Think again. Pet-loving business owners, as well as dog (and cat) experts, share their advice on allowing dogs and other pets at the office. Studies have shown that allowing dogs in the workplace can reduce work-related stress, improve morale and increase job satisfaction. But before business owners start bringing their dogs to work, or allowing employees to do so, it’s important to set some ground rules – and make sure everyone, especially those employees who don’t have pets (or may be allergic to pet dander), are on board with it. 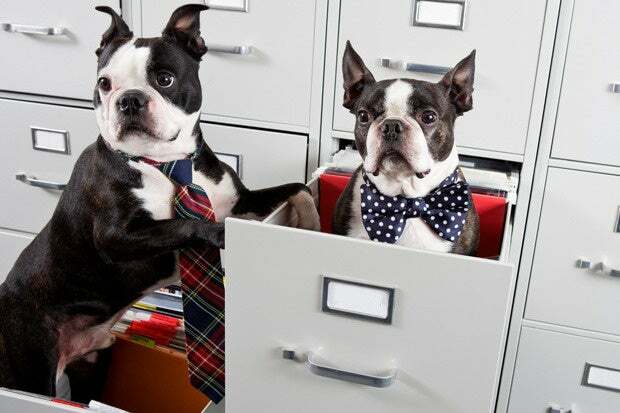 To help avoid coworkers’ pet peeves, here are 14 rules for bringing dogs (and cats) to work. Pets, as wonderful as they can be, can also be a distraction. So to ensure productivity doesn’t dip (and to be sensitive to those who may not want pets around all the time), designate certain days, or one day a week, as pet-friendly days, or bring-your-pet-to-work day. "At Petplan we have a Pets at Work shared calendar that our team uses to sign up for the days they'd like to bring their pet in,” says Natasha Ashton, cofounder, PetPlan, a pet insurance provider. Pictured here is Baily. "At MakeSpace we have Lord Stanley, the office pup. Everyone really comes together to look after and play with him on a daily basis," says Sam Rosen, found and CEO, MakeSpace. Pictured here is Lord Stanley. “Set up a Rufferree team so employees can share any complaints or praise about how dogs are interacting in the office,” says Kathryn Lisko, education specialist, Rover.com, a dog sitting service. “The dedicated team can [then] follow up with the dog's owner,” should an issue arise.